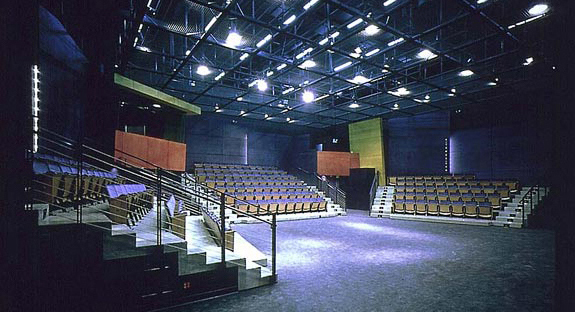 The Harvey Theater is a flexible, 200-seat theater space to serve intimate stage productions for both the Interlochen Arts Academy, during the school year, and the Summer Arts Festival. Acoustic challenges included the design for strong and clear unreinforced spoken-word to all seats, regardless of the stage configuration or the position of the actor(s). The flexibility of the space is augmented by a modular wire rope grid system overhead which allows the users to modify staging, scenery, lighting and overhead theater technology to suit the needs of a specific production.